Solar-plus-storage: How much battery capacity do you need? Lots of Solar Choice customers ask about battery storage for solar power, but not many have a clear idea of how much battery capacity they need. This article takes a look at the factors that come into play when considering how to choose the right amount of battery capacity for your solar-plus-storage system. Note that this article focuses on energy independence and not cost-effectiveness or the investment-worthiness of battery storage as an investment. We recommend using our Solar & Battery Storage Sizing & Payback Estimator tool to approximate the financial prospects of individual solar & battery system offers. How much energy independence do you want? The amount of battery storage that is right for your home depends first and foremost on your goals and budget. For many homes, energy independence is nearly as important a goal as saving money. We recommend thinking about your battery storage goals in terms of levels of energy independence. The list below presents the most popular uses of energy storage, sorted in descending order from greatest degree of energy independence to lowest degree of energy independence. 100% energy independence (literally ‘off-grid‘): Install enough solar, energy storage and other technology (small-scale wind, generator, etc) to meet all of your electricity needs. In this case you’ll need to install enough capacity to last you several days because you won’t have the grid to back you up. While this may be a popular aspiration, taking your home or business off-grid is more often than not financially impracticable or just not possible to do with solar-plus-storage alone (especially if you have limited roof space for panels). Check out a ‘reality check’ list of things to consider before going off-grid here. High energy independence (winter self-sufficiency, summertime surplus): Install enough solar and battery storage to get you through the average winter’s day without having to rely on the electricity grid (even though you’re still connected). You’ll produce excess solar power to export to the grid during the summer and will have enough to get you through the shortest winter’s day. You will likely have to rely on the grid as a backup if there is a multi-day spate of bad weather during which your solar panels haven’t managed fill up your battery bank. Summertime independence (grid reliance in winter): Install enough solar and battery storage capacity to get you through the average summer’s day. During the winter (and possibly autumn and spring) you’ll have to draw power from the grid to meet deficits. 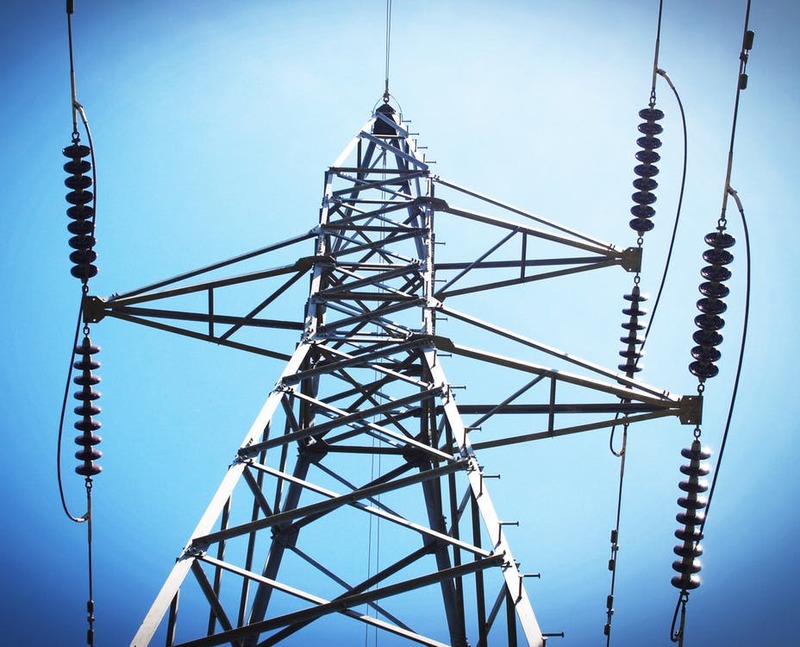 Reduced grid reliance during peak times: If you can’t afford to install enough energy storage to cover your peak time usage, you can still install enough to at least reduce your grid reliance during these periods. Energy storage as emergency backup: Install a small energy storage system to be used mainly in the event of a short power outage. What other factors do you need to consider in sizing your energy storage system? Desired degree of energy independence (as discussed above). The amount of electricity you use: If your electricity consumption level is low (under 20kWh/day), it will be easier and more affordable to install a solar-plus-storage system that will meet your daily needs. If your usage is higher, the outlay for a system that will meet your daily needs will also be more substantial; you may wish to look at ways to reduce your electricity consumption, or consider a lower degree of energy independence. Your electricity usage pattern: According to the analysts at Sunwiz, there are five basic residential electricity usage patterns in Australia: 1) ‘Double Peak’, 2) Evening Peak, 3) High Day & Evenings, 4) Day Focus and 5) Night Focus. Examples of these patterns can be seen in the graph below; they are also discussed in further detail in this article. 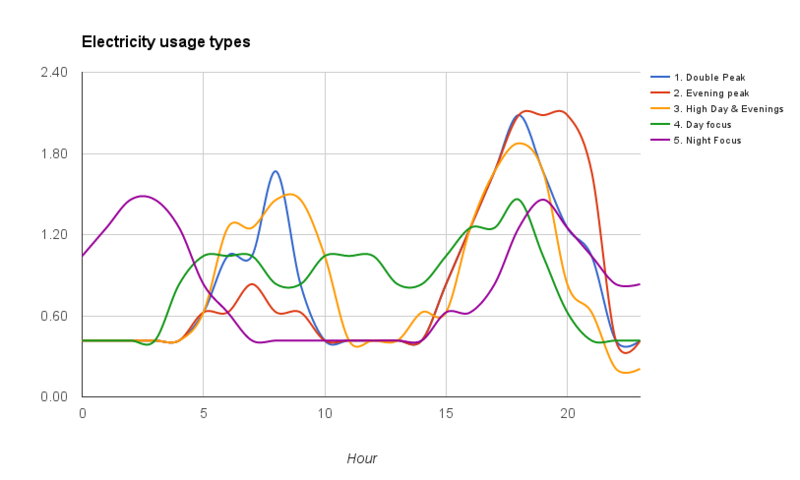 The most common energy usage patterns in Australia: Double Peak (blue), Evening Peak (red), High Day & Evenings (yellow), Day Focus (green) and Night Focus (purple). The size of your solar PV system: If you have a preexisting solar system onto which you’re planning on retrofitting energy storage, this will weigh heavily on how much storage capacity you can or should get. If, for example, you are currently exporting lots of solar to the grid at low feed-in tariff rates, you may want a larger amount of storage capacity to capture it. If, on the other hand, you’re installing a new-build solar system, it’s usually the wisest move financially to make sure it only produces enough electricity to meet only your daytime electricity demand and have a small energy storage system to capture any excess that would otherwise be ‘wasted’ on grid export. However, if greater energy independence is your goal, oversizing the solar system and installing a large battery bank is an option – and may even stack up financially, especially if you’re on TOU metering. Compare solar & battery quotes from installers in your area. Hi having a problem with solar. Have 6 k on shed roof with a bank of 5 batteries in a upright cabinet, plus 1.5 on the house. Still get a bill of $1000 to $1100 per quarter. There are a few things that could be going wrong here. My first question would be about whether the panels are shaded at all – even partial shading on the roof could have a big impact on your solar system’s power output. Second thing I would ask about is whether inverter is working. The third thing I’d ask about is how much energy you have need for in your home throughout the day – are they over 40 kilowatt-hours per day? If your usage is very high, your system may only making a dent in it. What were your energy bills like before the system was installed? Hi, I have a 2 kW roof top array. I’m considering installing nickel iron batteries to be able to store the solar energy that I don’t use so I can use it in the evening. How many batteries will I need? What size voltage and amp hours? Any reason you’re looking into nickel-iron, or are you entertaining other options as well? You can compare a range of battery products using our Battery Storage Product Comparison Tool. Additionally, you can get quotes from installers in your area by filling out our Solar & Battery Quote Comparison Request form – to the right of this page. Sorry!! Forgot to add to my message of 5 million s ago …. I had a quote today over the phone, after a long conversation, of $5,300 to install a 3kw system (12 x 260w panels) with an SMA inverter. That seems rather a lot compared to your price index for August. The installer lives locally and works for himself, no employees. Does that price sound a bit much to you?. Only wanting your opinion of course. Thanks for your comments and apologies for the late reply. $5,300 is on the high side for a 3kW solar system, but may not unreasonable depending on what panels are being used and if there are other bells and whistles (monitoring, hot water diverter, etc) attached. If it’s just a basic solar+inverter system, however, then it’s likely that you’ll be able to find a better deal by searching around (you’re welcome to get free quotes from us). To get an idea of what size system you might need, I’d recommend starting with two of the many tools we’ve developed: 1) Simple Solar PV System Sizing Estimator, and 2) Solar & Battery Storage Sizing Estimator. The next step would be to speak with a few installers for more detailed assessments and pricing. Hi James. I am suddenly having to make a quick decision about getting pv solar system on my roof. But in having trouble calculating how big a system I would need, plus now I’m reading here about storage batteries as well, and my head’s spinning! Haha. Would I be able to lay out for you my situation and get your advice?. Really don’t know who else to ask. I live in Geraldton, me and my adult son, flat rate power at 24c, no off peak etc.. North facing tin roof. Have so far been averaging about 11 or 12 units per day (over the 2 years I’ve been in this house), BUT that’s partly because I had a gas hot water system (which just broke), and partly because I have had to be VERY careful with my use of our reverse cycle air con. I’d like to be able to run the aircon in summer whenever I want to! I’m also now I interested in getting a heat pump hot water system, I’ve heard they are very cheap to run, and this has prompted me to suddenly look at pv solar. I’d estimate that we probably use 70% of our electricity during daylight hours, mostly arvo? I’ve been advised by some dude to get a 3kw system. Does that sound right to you? And what if I wanted to add a storage battery, what would you advise with the limited info I’ve provided? I may be misreading it, but the coloured graphs for Examples 1 & 2 for different amounts of PV appear to be exactly the same? Hi Peter. Thanks for pointing that out – a pure mistake on our part. I have updated the graphs with the correct ones. Hi James, a really interesting article. The “tool” which you mention – is there any progress on it? I live in Tasmania where our power usage pattern and metering is different to the rest of the country and none of your scenarios are that helpful for me. I’ve had my array generating data for more than 800 days. I have 6.72kW of panels into a 10kW inverter, average 48kWh of energy consumption per day, export around 50% to grid, generate on average 27kWh (maximum 50kWh). A mostly wild-guess would tell me than I need at least a 25kWh battery storage which would still be “wasting” a lot of generation to the grid during summer? There will be an announcement when our tool becomes live, if you want to join our mailing list (you’ll find a signup field to the left of this page). I’ve run some of your numbers through our calculator and it appears that rather ‘wasting’ your generation into the grid during summer, the problem would actually be the reverse – your panel array would probably never fill up a 25kWh battery bank, even if you expanded it to a full 10kW of capacity. The reason for this (at least in our model) is that you’re probably already consuming a lot of the solar power during the daylight hours – and each unit of solar you ‘self-consume’ is one less unit that goes into the batteries. A 15kWh battery bank might be a bit better with your current 6.7kW array (preventing ‘wastage’ in the summer). Alternatively, if you filled out the inverter capacity to a full 10kW of solar, that would afford you roughly 50% energy independence on average and roughly 65% independence in the summer (without sending too much solar into the grid). By our estimates, 20kW solar and 40kWh of storage would allow you daily energy independence on average and in summer. For winter, you’d still be getting about 40-50% of your electricity from the grid unless you cut your electricity consumption then. Hope this helps – happy to try to help you out with further details if you have more questions. Best of luck! Do you run an aluminium smelter at home? Thanks for this analysis! I found it helpful, however I was wondering why with pv becoming so cheap does the model for energy storage not change to reflect this shift? For example: I have been recording the daily output of my 5kw rooftop system. In the middle of winter, on the worst rainy day it produced 9.8kw. Therefore a 10kw pv system might put out close to 20kw during the day. In your analysis, your third example of an energy efficient household consumed 15kw per day..
Why is it still common practise to have either multiple days worth of power stored in battery banks and or to augment pv with a gen set when increasing the PV array and adding another charge controller is a more cost effective solution? If I’m understanding you correctly, you bring up a very interesting point – why not just install more PV (which will still generate some power even on a rainy day) rather than installing pricey batteries? Correct me if I’m wrong. If you’re aiming to be off-grid or for total energy independence (which most households won’t – and shouldn’t – bother to do), then it does make sense to oversize for worst-case scenarios. However, as you’ve pointed out, the fact that a solar system will continue to generate electricity on a bad-weather day, it could very well make sense to ‘slide the dial’ up for solar PV and down for batteries – but it would depend on the circumstances of the home in question. For those who are on-grid with their solar-plus-batteries and simply aiming to get the most out of their solar, however, it probably makes more sense to be conservative and avoid ‘wasting’ solar power by sending it into the grid – in this case making sure that the solar array is not too large is important. Thanks again for your thoughts – this is something that we will certainly bear in mind for future analysis – especially when our research concerns going off-grid or achieving a high level of energy independence! Thanks for posting this analysis – super helpful as always. Looking forward to playing with the tool (and soon, getting some batteries)!